Circa 1827! Butterflies will cover these flowers! 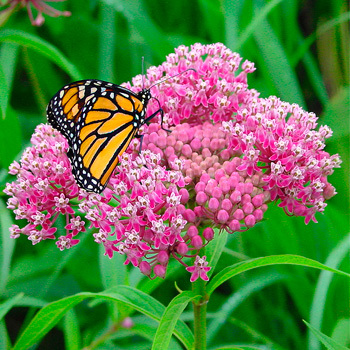 Milkweed will attract butterflies and bees, and is also deer resistant. 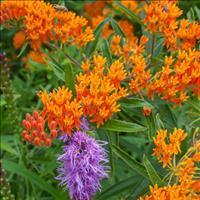 In the wild, red milkweed grows in swamps and wet meadows. It is a great performer in rain gardens or low areas, including banks along ponds or streams, and looks lovely as a mass planting, growing well in borders in rich soil. A top beneficial insect attracting species, nurturing many species of helpful bugs. Plant: Upright and clump-forming with tannish-green to purple stems 3-4' with lance-shaped, tapered leaves about 3-6" in length. Leaves are a food source for monarch butterfly caterpillars. Flowering: Clusters of fragrant, small pink flowers at stem ends make great cut flowers. They serve as a nectar source for monarch butterflies. If removed when still green, they can be used in dried flower arrangements.